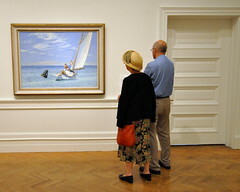 Daydreaming at the Corcoran by Kevin H.
The average day at an art museum goes something like this. The doors open, people stroll in to look at some art, and later in the day the doors close until the entire process is repeated again the next day. Unlike the world of politics or the world of sports, the world of art is relatively free of any drama. Until…the HVAC system goes on the fritz! Yesterday, the Corcoran Gallery of Art decided to take down its Turner to Cézanne exhibit due to the malfunctioning climate control system. According to gallery spokeswoman Kristin Guiter, “We had some issues with the new air handler, the one providing the heating and cooling to the gallery. The levels were fluctuating.” You see, art doesn’t like fluctuations in temperature and humidity, especially art that is worth millions and millions of dollars. Despite the moody HVAC system, not all galleries within the building are closed. Be sure to check out the Helios: Eadweard Muybridge in a Time of Change exhibit this weekend.